So Joe’s bike is finished (completely since these shots were taken) and I’m waiting until I get back from vacation to do the paint. It seemed like it might be a little labor intensive so I didn’t think I should rush it. Here are the current shots. The next ones will blow your mind. 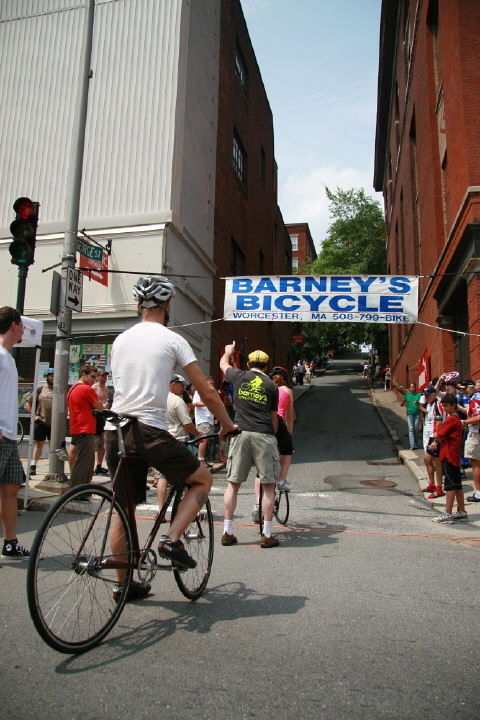 The Major Taylor Association’s annual George Street hillclimb was this past weekend and everyone was so fast!! The winning time was under 23 seconds by Rich Hollenbeck. Which basically means he averaged 15 miles an hour up an 18 percent grade. Crazy. We had a good Circle A turnout with myself, Hilary, Brent, Ken, and the Burkes. Congratulations to Liane Burke for getting 3rd! I also did a couple of repaints including this Moser track frame that has been around the block. I’ve seen it exchange hands several times and it has definitely seen some wear and tear. I was happy to get it back to riding condition again. And Adam finally came by and built up his bike. He put all SRAM Red on there with a nice set of DT wheels. The final weight with the pedals was 16.5 pounds! Can’t wait to hear the full ride report. I wish this frame was for me. Chris’s cross bike is painted, frame-saved, and ready for shipping. I’ll be sad to see it go. The paint is a classic blue with white panels and silver lug-lining. Here are the shots of the finished bike. Absolutely gorgeous. I also painted a gas tank for Tom from White Electric Coffee. It came out pretty sweet and I should have some more pictures of it soon on the bike. Joe’s fillet brazed road frame is up next as well as a bunch of repaints. It’s going to be a busy week so check back for more updates. Posted on July 21, 2008 November 25, 2008 Categories Bike Building, Bike Painting1 Comment on I wish this frame was for me. Chris’s cross frame and fork are together and looking very much like a bike. A bunch of soaking, some sandblasting, and bunch of filing and it’ll be ready for primer. The paint is going to be real classy. I love the color scheme he chose and am excited to see it on the bike. Here are the latest shots.